Wear mud boots and weather-appropriate layers that can get dirty. We’ll provide tools, gloves, and guidance. Parking available north of 90th and east of 24th. Metro Route #61 stops near the park northbound. 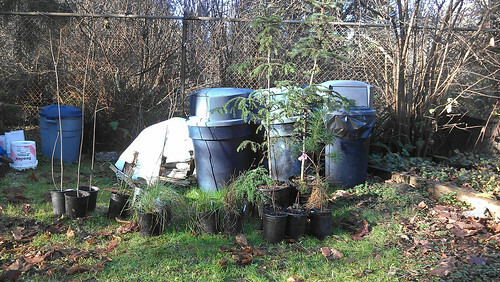 Pictured here: Cascara, vine maple, silver spruce, tapered rush (for the wetlands) and others. This month’s work party will be run by Drexie Malone and Tad Anderson, and they have a variety of plants ready for you to help place into the park. The plants come from Swansons Nursery‘s “Trees for Salmon” Program, the Parks Department, and private donations. Some are being introduced to the park, and others exist only because of previous restoration planting. Some are already found in the park growing wild. Join us for what is likely to be the last planting work party of the season. Planting is part of the reward for the earlier work of removing invasives. Can’t make a work party? Please consider donating to the Seattle Parks Foundation, which provides fiscal sponsorship to North Beach Park. Your donation to them is tax deductible and will go towards park projects. Click here to read about the park and donate.